Sushi rice is very easy and quick to make since it requires only three steps: washing the rice, cooking it, and tossing with a vinegar marinade. The most important thing is to use a short grain Japanese style rice and to make sure you cook it well (it shouldn’t be mushy). Preferably buy a rice grown in Japan or California. Japanese style rice is generally one of two varieties: sasanishiki or koshihikari. Koshihikari has many subtypes, including hitomebore, akitakomachi, hae-nuki, hi-no-hikari, kirara, tama-nishiki, kagayaki, and tamaki-mai; often koshihikari will be identified by only its subtype. These types of rice give the best texture for sushi. Preferably use rice that was harvested more than 6 months ago. Some rice may be labeled as “new crop rice”, which is rice that is sold just after harvest from October through February. When it is freshly harvested, the grains are moister since the grains have had less time to dry out; it is too moist and tender for sushi though it is wonderful as table rice (use less water than normal and use the same cooking method that you use for regular rice). Once new crop rice has aged in the package for a few months (check the package date to estimate) it will be dry enough to use for sushi. For sushi, use regular rice (which is not labeled as new crop) or use new crop rice sold after New Year’s. Immediately after the rice cooked, it is tossed with a vinegar marinade made of rice vinegar, sugar, and salt; this marinade is what makes the rice into sushi rice. Preferably use a rice vinegar labeled “jun-komezu” (pure rice vinegar) for making sushi rice. “Jun-komezu” should have a golden color and should be made only from rice and possibly water. Ordinary komezu, which is made from a combination of rice and other grains (i.e. it is a mixture of rice vinegar and grain vinegar) shouldn’t be used for sushi rice; jun-komezu has a richer flavor and aroma. There is no need to buy sushizu, which is a ready-made sushi dressing since you can easily mix your own. If you can’t find jun-komezu then preferably use a rice vinegar whose only ingredients are vinegar and water (no sugar or salt because that indicates it is sushizu). Traditionally, a wooden sushi tub called sushi-oke, is used for tossing the rice with the vinegar marinade and for keeping the sushi rice warm and moist when covered with a lid or towel. They can be expensive to buy (around $90 for a high quality one imported from Japan), so if you are just starting learn to make sushi or only plan to make it occasionally, you can making do with something that you already own. Use something that is large enough to toss the rice and has raised sides a few inches deep. Hiroko Shimbo says that the best substitute is a wooden salad bowl since this will help the rice to absorb the dressing and not become mushy, but if you don’t have one use something that is large enough to toss the rice. See my ingredient buying guide for more information about what products to buy for making sushi rice. Source: Primarily from “Master Recipe for Sushi Rice” and “Sushi Vinegar Dressing” from “The Sushi Experience” by Hiroko Shimbo (her sushi rice recipe is available on cookstr.com and also on gourmet.com which has a really useful video of Hiroko Shimbo showing how to toss the rice with the rice vinegar). Also used “Sushi Rice” from “Japanese Cooking: A Simple Art” by Shizuo Tsuji as reference. Yield: 2 rice-cooker-cups of raw rice (4 cups lightly packed cooked rice) serves two as a main meal. 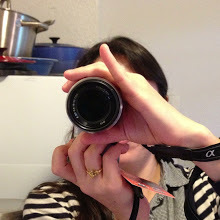 1.5 rice-cooker-cups of raw rice serves two with light appetites or if there are several side dishes. The sushi vinegar dressing quantities are proportional to the amount of rice (though the amounts are slightly rounded so that they can be measured with standard kitchen measurement tools); you can scale these accordingly for arbitrary sizes of rice. Follow the ingredients for one of the two sets of ingredients listed below, depending on how much rice you want to make. For a larger yield, scale the vinegar marinade ingredients so that they are proportional to the amount of rice that you make. Yield: 3 cups lightly packed cooked rice. Serves 2 people with light appetites or when paired with a substantial meal. Yield: 4 cups lightly packed cooked rice. Serves 2 people. 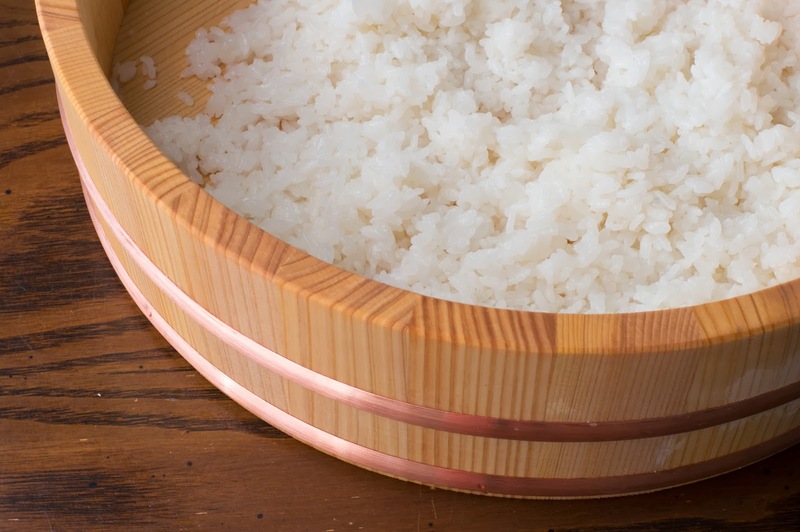 If you are using a sushi tub, fill it with cold water and allow it to soak for about 30 minutes while the rice is cooking, otherwise the rice will stick to the dry wood and the wood will absorb a lot of the vinegar dressing instead of the rice. (If you are using a wooden salad bowl, don’t soak it because it could cause it to crack.) If using a wooden spatula to toss the rice, soak this also to help prevent sticking. Wash the rice in several changes of water until the water is nearly clear. Drain. I use a fuzzy logic rice cooker since that’s what is easiest for me (See Hiroko Shimbo’s sushi rice recipe for instructions on how to cook sushi rice in a pot if that’s what you’d like to do). Sushi rice is often soaked for 30 minutes if it is cooked on a stovetop, however in “Hiroko’s American Kitchen” by Hiroko Shimbo that she suggests that if you have a modern rice cooker with “sensors, computer controlled functions or induction heat technology, omit the soaking step”. I find that soaking the rice before using a rice cooker makes the rice become too soft and plump for sushi; I prefer a firmer bite, so I don’t soak my rice before cooking it in my fuzzy logic rice cooker. Place rice in the rice cooker bowl, add water, and (if using) add konbu. Cook the rice using the “sushi” setting if you have one. While the rice is cooking, mix together the amount of vinegar, salt, and sugar listed below which corresponds to your amount of rice. Mix until the salt and sugar dissolves and set aside until the rice has finished cooking. When the rice is nearly done, drain and wipe the sushi tub dry. Immediately after the rice has finished cooking, use a plastic rice paddle or a flat wooden spoon to quickly toss the rice with the vinegar marinade until the rice has absorbed all of the marinade in the sushi tub (about 2 minutes). Use a horizontal motion to toss the rice so that the grains don’t get mashed. Here is a video of Hiroko Shimbo showing how to toss the rice. Once the sushi rice is made, it should be kept at room temperature in a covered container (such as in a sushi tub covered with either a lid or a damp kitchen towel or another type of container covered by a kitchen towel) so that it doesn’t dry out. It shouldn’t be refrigerated, since this will dry out the rice. Preferably use the sushi rice within one hour, but since the vinegar is a preservative, the rice will last for about half a day at room temperature. If you have assembled the rice into raw fish sushi and need to store it, then you can refrigerate it to keep the fish cold for up to an hour before the rice gets undesirably dry. Before you shape or mold sushi rice, dip your fingers in some water mixed with a few tsp of vinegar (about 2 tsp rice vinegar and 6 Tbsp water), rub your hands together, and shake off the excess water. You can use grain vinegar for this; it isn’t necessary to use “jun-komezu” (pure rice vinegar). This hand-vinegar (“tezu”) will prevent the rice from sticking to your hands.